If you haven’t gotten an interactive toy for your dog yet, well then, I feel sorry for your dog. Interactive toys, whether they involve treats or not, are a fantastic way to provide mental and physical stimulation to your dog. They keep things interesting, which is something we can all appreciate. Last month, Teton got a new interactive treat toy from Chewy.com. We’ve tried a handful and I think this is probably the most well-made and one of the best executions we’ve seen. Dog Moms and Dog Dads, I present to you, the Starmark Treat Dispensing Bob-a-Lot. The Bob-a-Lot comes in either small or large. Small is recommended for dogs that are 20 lbs and less, while large is best for dogs over 20 lbs and can hold as much as three cups. Woof. Teton can be a finicky eater when it comes to his breakfast and dinner, so I prefer to fill interactive toys with treats so he’s more motivated to play with them, but if you have a dog who inhales their dinner or is generally super excited to eat, you could definitely put their normal kibble into the Bob-a-Lot and make them work for it! The Bob-a-Lot lid screws on and off and the top of the toy is where you dump in the treats. Teton’s latest favorite treat I purchased at a boujie pet store in Seattle, but as luck would have it, Chewy.com carries them! These are Sojos Good Dog treats in the Blueberry Cobbler flavor. They are tiny little crunchy bones that are easily broken, which is what I did before putting a few into the Bob-a-Lot. They’re small enough that you wouldn’t need to break them, but I like to because, well, it makes Teton work harder and longer. While you’re loading the Bob-a-Lot, you might get a creeper. Once it’s locked and loaded and the top is screwed back on, you can adjust the hole that the treats come out of. Obviously, the more narrow the hole the harder it will be for your dog to get the treats out. I made it just slightly more narrow for Teton the first time he tried it, and I think that was a good difficulty level for him. I think Teton could have used the small size Bob-a-Lot, but the large is perfectly fine, too. This sucker is on sale for under $20 (large) or under $14 (small) on Chewy.com right now and it’s worth it. Take mine (and Teton’s) word. Happy Memorial Day! I hope you are spending quality time with the ones you love, doing what you love and remembering the reason for this holiday. 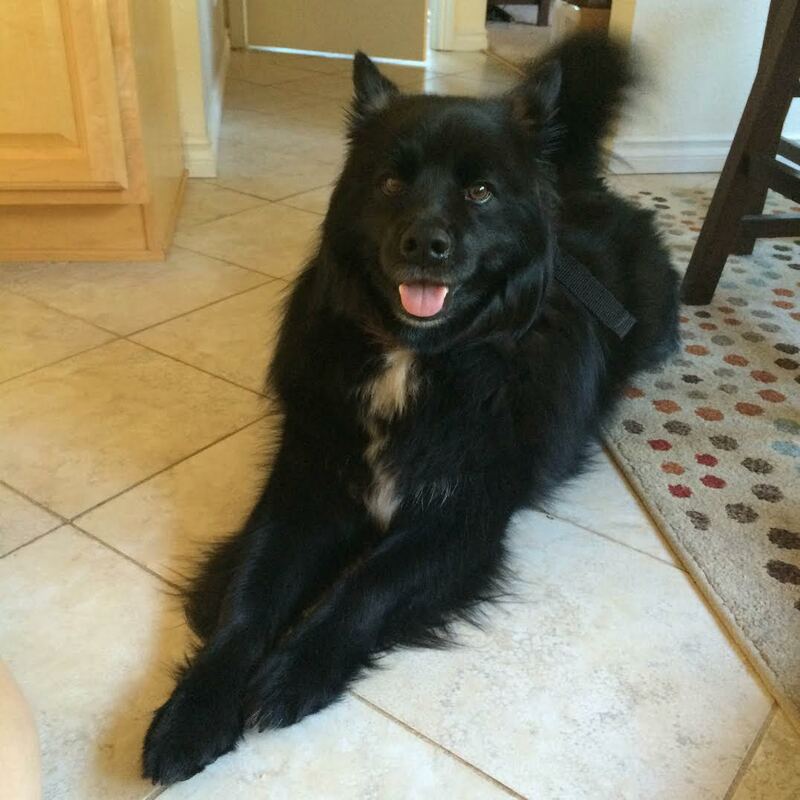 I did a hero WOD at our gym this morning, picked up some groceries for a BBQ tonight, and after I hit publish on this post, Teton and I will be walking around the ‘hood a few miles. Pretty much a perfect day as far as I’m concerned! This, my friends, is Outward Hound’s Doggy Blocks interactive dog toy, sent to us from our pals over at Chewy.com. Teton has tested about four different interactive toys, but this one is the most advanced that he’s had. This toy, much like others we’ve tested, spins to reveal treat compartments. But, in this version, there’s an extra challenge because the treat compartments are covered by the yellow blocks that sit atop the first layer of the toy itself. As shown in the photo above, there are treat compartments that are the exact size of the yellow blocks that sit above them, but there are also circular shaped compartments next to square shaped ones that are revealed when your dog spins the treat with his or her paws nose. Using Outward Hound’s Doggy Blocks is very simple. After removing the yellow blocks and twisting the top layer of the toy to reveal each of the treat compartments, fill said compartments with any type of treat (or kibble!) that will motivate your dog. I like to let Teton watch me put the toy together so that he understands there are treats inside. 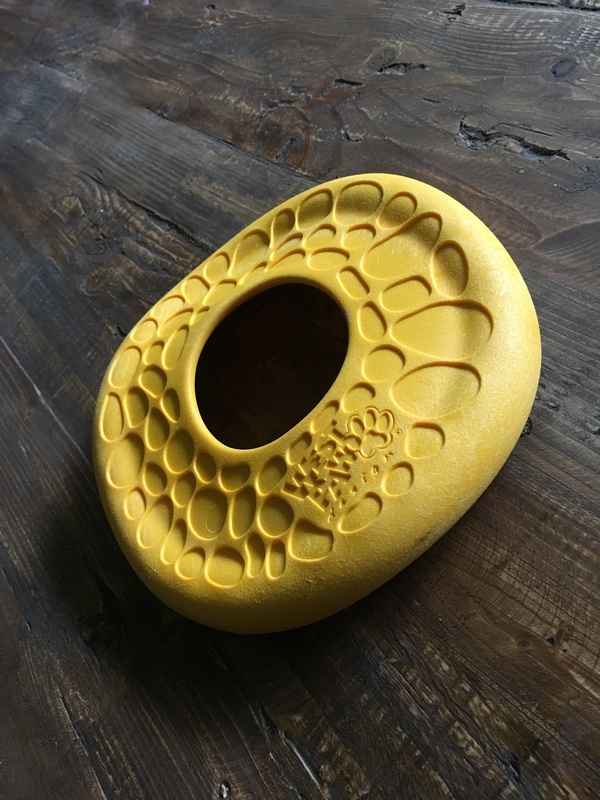 You can also see that each yellow block, as well as the spinner itself, has strategically placed holes that allow your dog to smell the treats inside. Once you’ve put the Doggy Blocks back together, let your dog have at it! The Outward Hound Doggy Blocks is hands down my favorite interactive toy yet. It incorporates the excitement of the spinner (which allows for more treat hiding) and the challenge of the blocks which means it takes longer for your dog to trouble shoot and work toward his or her reward. Outward Hound’s Doggy Blocks is ON SALE now at Chewy.com for just $11.24. Snag it and a few bags of fun new treats for your pup! 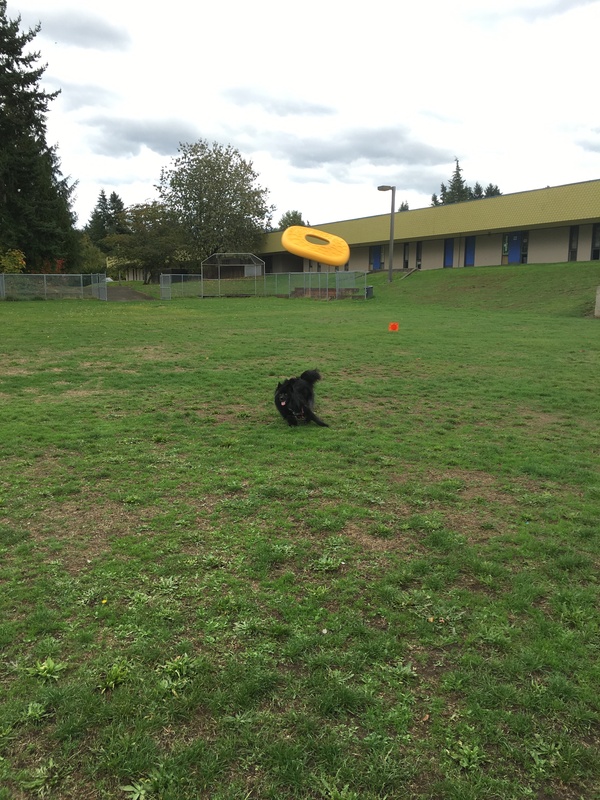 About a week ago, Chewy sent Teton a brand spanking new West Paw Zogoflex Air Dash Frisbee to test. This hearty frisbee is made in the USA of a durable foam. Teton isn’t a chewer, but if he were I don’t think I’d be worried about this toy holding up. 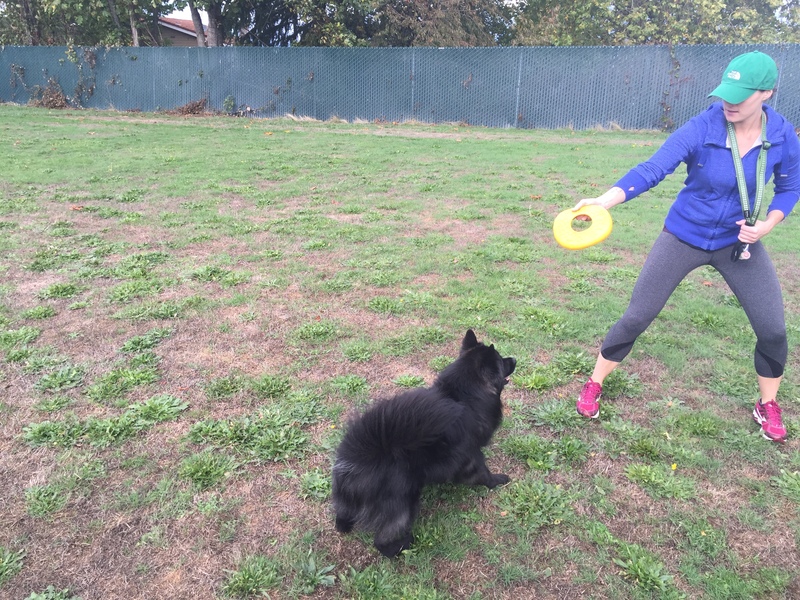 The Zogoflex Air Dash Frisbee isn’t your typical frisbee. 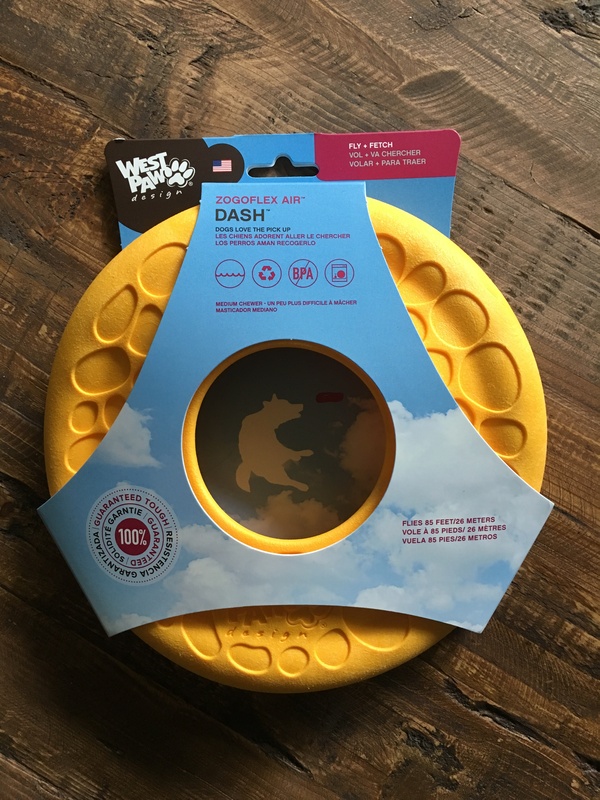 It’s injected with something West Paw calls Air Technology that essentially means the center of the toy is air-injected and as a result can be flung further and will fly higher in the air when thrown. 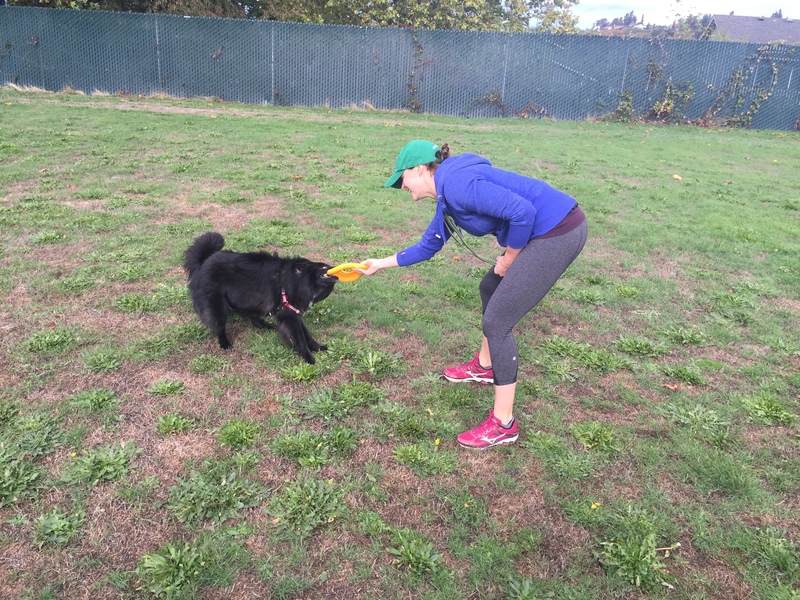 I’m not the best frisbee thrower apparently, but then again, Teton isn’t the best fetcher ever. Still, we had lots of fun with this toy at the park near our house. The Zogoflex Air Dash Frisbee is $17 on Chewy. If you’re looking for a new toy to throw for your dog in your yard or at your local dog park, this is a great pick! 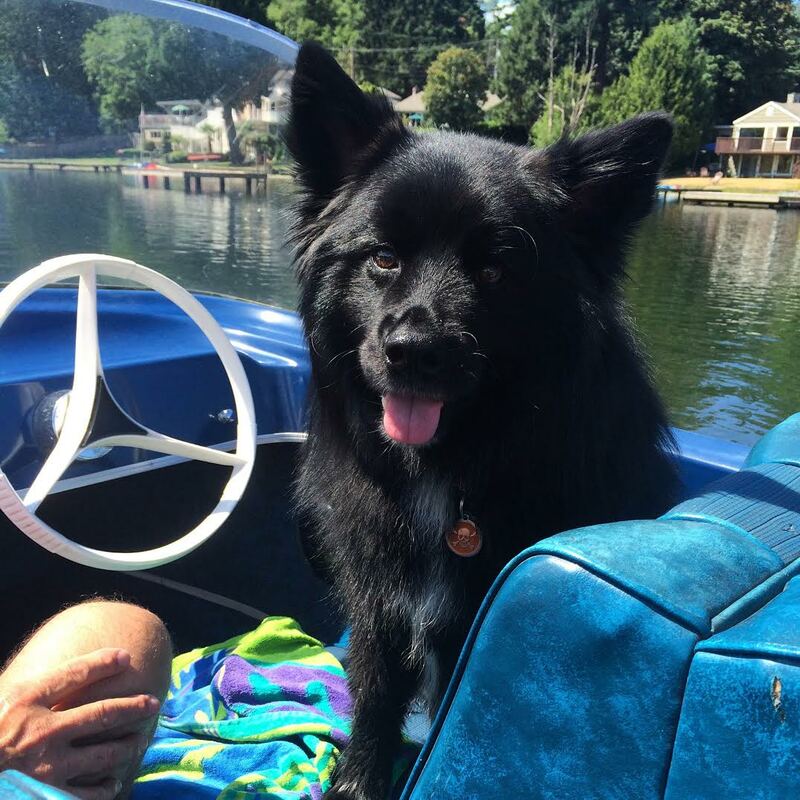 Teton went on a boat for the first time in his life earlier this week. The first 10 minutes were probably the worst of his life and he spent them shaking on his dad’s lap, but after that initial “What in the hell are you doing to me, Mom? 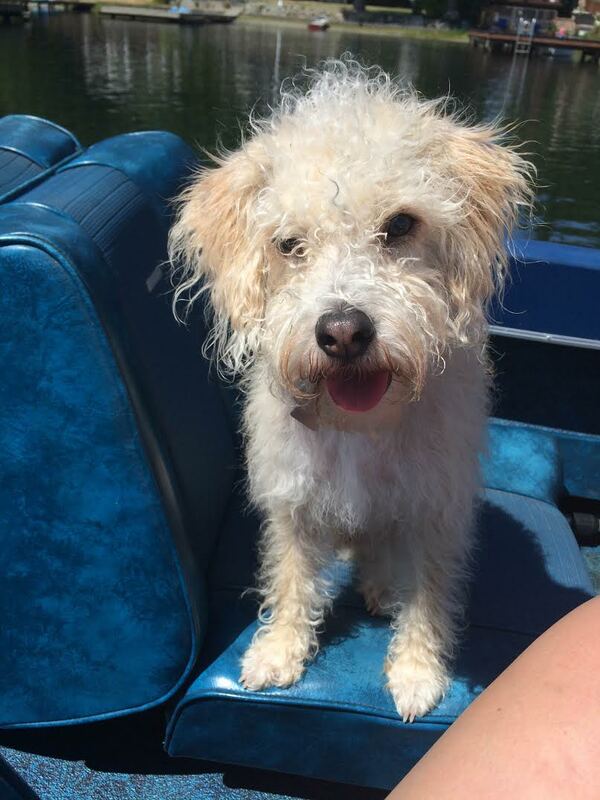 !” he was more or less happy as a clam cruising around the water. 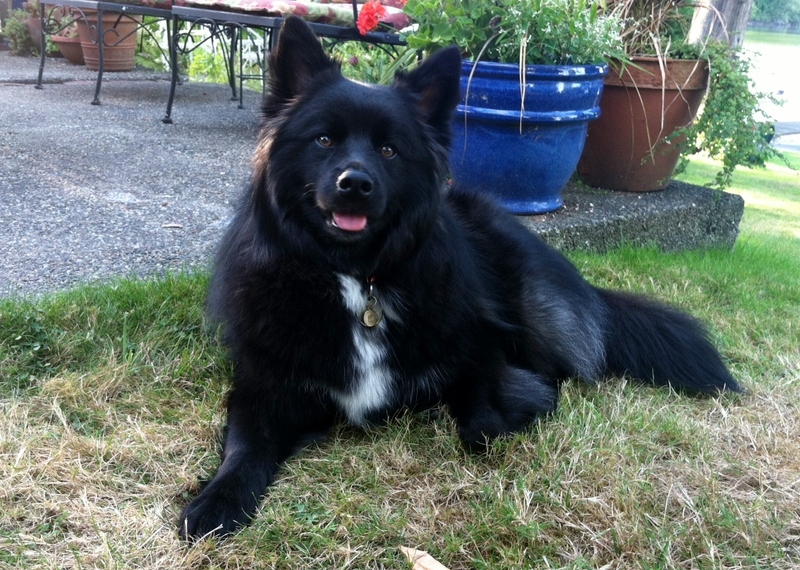 His pal Milo (also known as Miles) didn’t have as traumatic an experience. 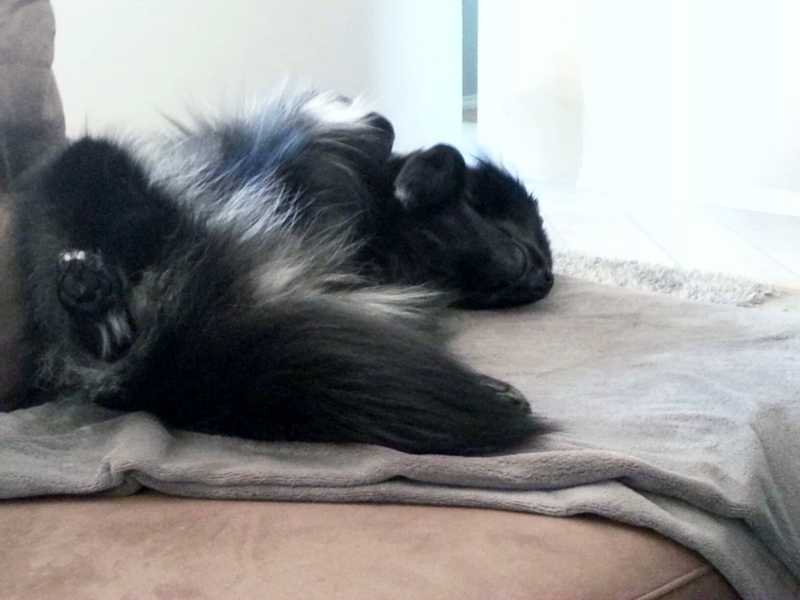 It’s been hot here in good old Washington State, and I think it’s safe to say most dogs who have lived here their whole lives aren’t used to the heat. Teton wears his Kool Collar on the daily and I really believe it helps cool him off. It’s hard impossible to tell that he’s wearing it here, but he’s a happy cool little dude when it’s around his neck! I took a few vacation days earlier this month and decided that Teton deserved a new toy since I was celebrating, um, being on vacation……..right. T’s favorite toys are squishy, fluffy or furry toys that he can carry around the house and throw up in the air for himself. Knowing that, I picked this delightful little gem. 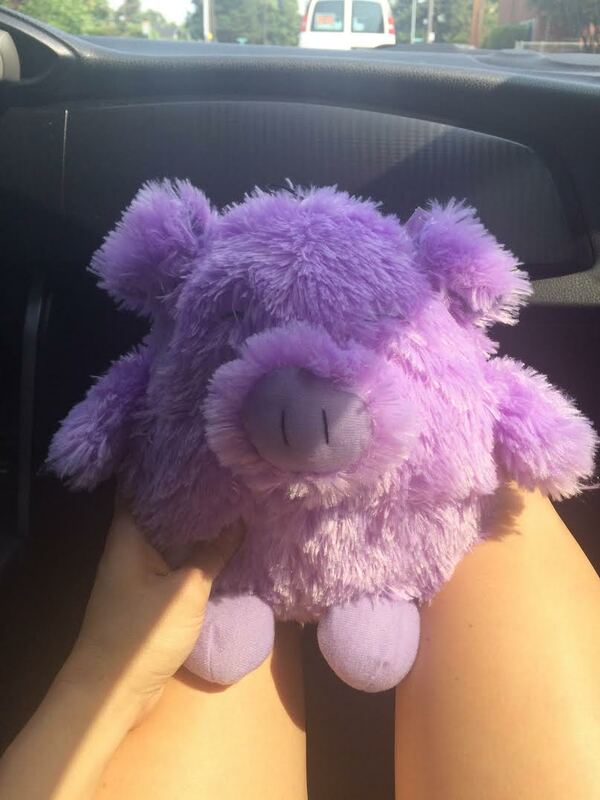 Teton waited patiently for his new purple pig and played with it for a while after I gave it to him. (It’s been a while since he got a new toy.) It has one of those non-traditional deep squeakers which is fun (slash less annoying) and it’s round so it’s easy to throw and retrieve. This particular toy may not get as much love as some of T’s other favorites, but it was reasonably priced at $8.95 so I’m good with that. New toys for the win! How was your Labor Day weekend? 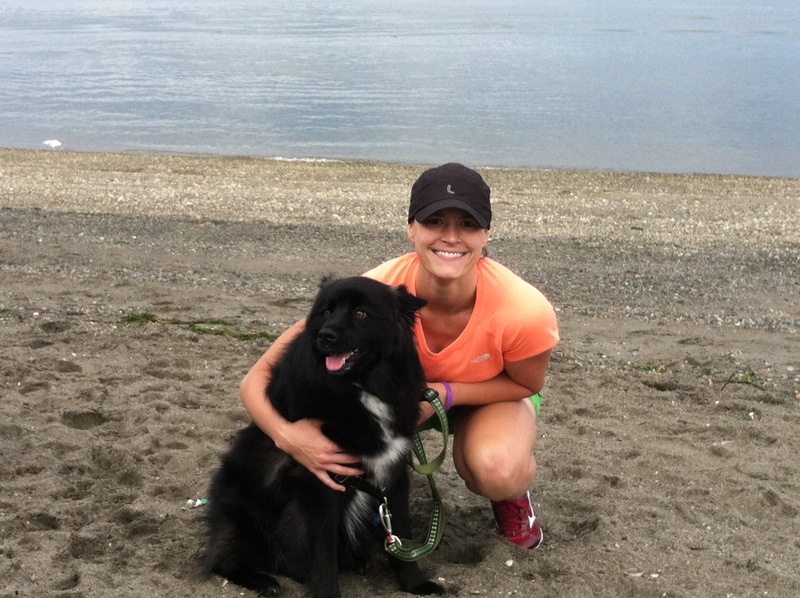 After enjoying the sun all weekend we went for a nice, long walk to the beach on Monday morning. We rounded out the day by gettin’ down on some ribs at my parent’s house. I’m not ready for summer to be over. It’s still sunny and warm ’round these parts and I am just fine with that! Teton, on the other hand, has definitely been feeling the heat. Does anyone else have a dog who sleeps with their tongue out? It’s ridiculous! 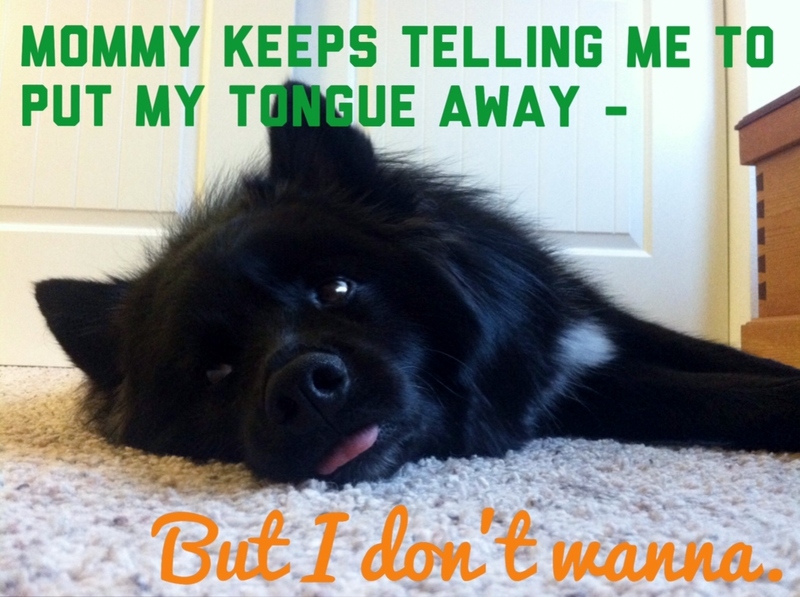 I used to make fun of Teton (ok, who am I kidding – I still do) for always having his tongue out but then I read somewhere that dogs do that to help regulate their body temperature. Not so dumb after all. 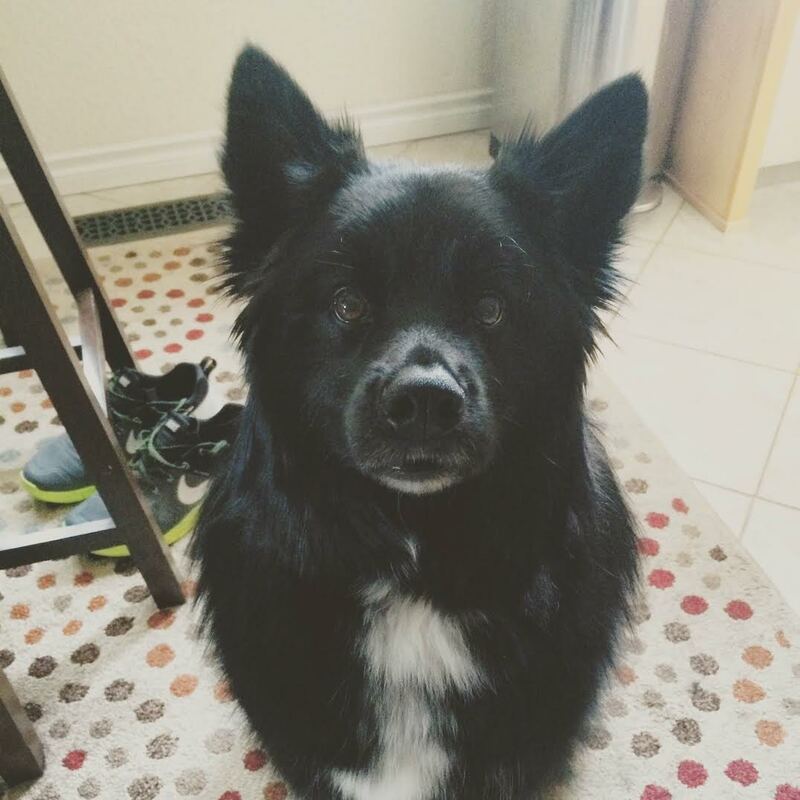 Here’s another great shot of him being special. And the skies opened and the stars aligned and trumpets rang out in jubilation. 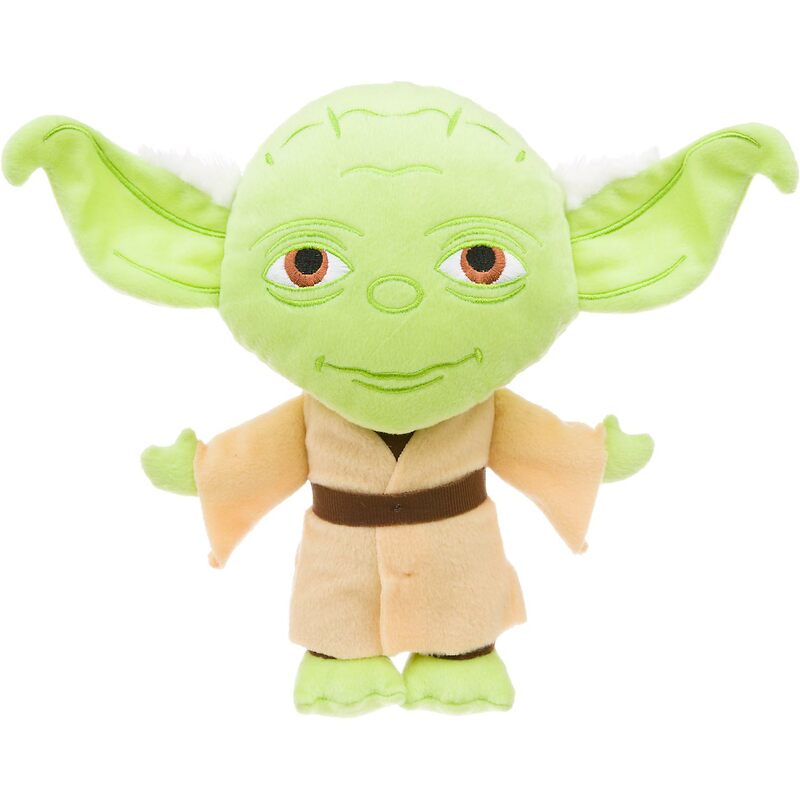 That, my friends, is a stuffed Yoda toy. 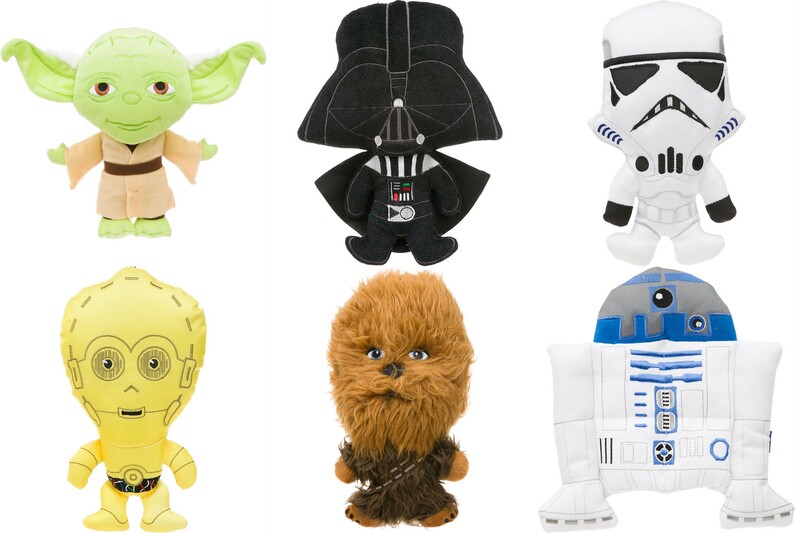 Petco has launched an entire line of Star Wars toys, clothes, and beds(!) for dogs and cats. If you’re looking for a fun costume for your dog this Halloween, check out the Chewbacca Dog Hoodie, the Boba Fett Dog Hoodie, or the Yoda Dog Hoodie. Cute, well-priced, and not bulky and awkward like so many doggie Halloween costumes. I didn’t buy anything for Teton but he may get that stuffed Yoda at some point. It’s just too cool to pass up.